The Latin word “basilica” was originally used to describe a Roman public building (as in Greece, mainly a tribunal), usually located in the forum of a Roman town. In Hellenistic cities, public basilicas appeared in the 2nd century BC. After the Roman Empire became officially Christian, the term came by extension to refer to a large and important church that has been given special ceremonial rites by the Pope. Thus the word retains two senses today, one architectural and the other ecclesiastical. WHICH WAS THE FIRST BASILICA? 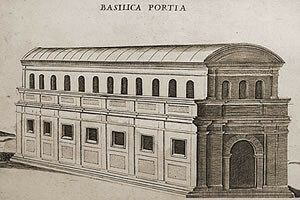 The oldest known basilica, the Basilica Porcia, was built in the Forum of Rome in 184 BC by Cato the Elder during the time he was censor. 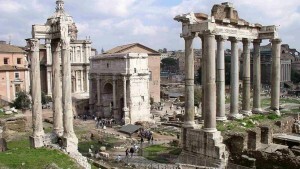 By the end of the Roman empire, the Forum alone had at least seven basilicas. 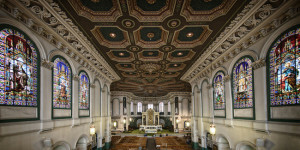 The Basilica Cathedral of St. John the Baptist, Canada. Modern Christian churches are called basilicas because ancient Roman Christians, who had no places to meet and worship, would congregate in public buildings called basilicas. 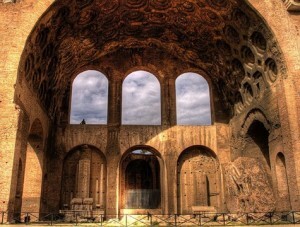 In architecture, “basilica” in its earliest usage designated any number of large roofed public buildings in ancient Rome and pre-Christian Italy, markets, courthouses, covered promenades, and meeting halls. Gradually, however, the word became limited to buildings of a more or less definite form: rectangular walled structures with an open hall extending from end to end, usually flanked by side aisles set off by colonnades (in large buildings often running entirely around the central area), and with a raised platform at one or both ends. Basilica Mission Dolores, San Francisco, USA. 1) Propylaeum – the entrance building of a sacred precinct, whether church or imperial palace. 2) Atrium – in early Christian, Byzantine, and medieval architecture, the forecourt of a church; as a rule enveloped by four colonnaded porticoes. 3) Narthex – the entrance hall or porch preceding the nave of a church. 4) Nave – the great central space in a church. In longitudinal churches, it extends from the entrance to the apse (or only to the crossing if the church has one) and is usually flanked by side aisles. 5) Side Aisle – one of the corridors running parallel to the nave of a church and separated from it by an arcade or colonnade. 6) Crossing – the area in a church where the transept and the nave intersect. 7) Transept – in a cruciform church, the whole arm set at right angles to the nave. 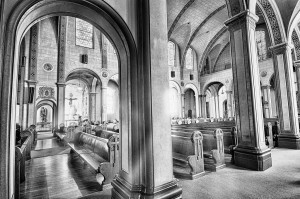 Note that the transept appears infrequently in Early Christian churches. Old St. Peter’s is one of the few example of a basilica with a transept from this period. The transept would not become a standard component of the Christian church until the Carolingian period. 8) Apse – a recess, sometimes rectangular but usually semicircular, in the wall at the end of a Roman basilica or Christian church. The apse in the Roman basilica frequently contained an image of the Emperor and was where the magistrate dispensed laws. In the Early Christian basilica, the apses contained the “cathedra” or throne of the bishop and the altar. 9) Nave elevation – term that refers to the division of the nave wall into various levels. In the Early Christian basilica, the nave elevation usually is composed of a nave colonnade or arcade and clerestory. 10) Clerestory – a clear story, i.e. a row of windows in the upper part of a wall. In churches, the clerestory windows above the roofs of the side aisles permit direct illumination of the nave. 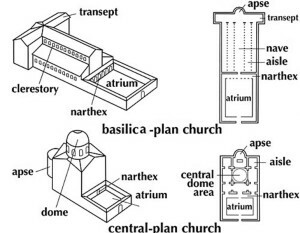 The basilica plan, with its nave, aisles, and apse, remained the basis for church building in the Western Church. It gradually passed out of use in the Eastern Church. The exterior of such a building was simple and was rarely decorated. The simplicity of the interior, however, provided surfaces suitable for elaborate ornamentation. 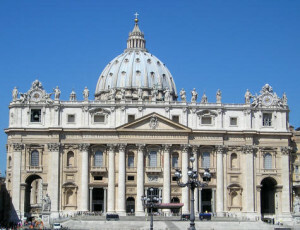 Although the basilica is primarily characteristic of Rome, there are many examples elsewhere. The Romans were able to build massive complexes like this because of an ingenious engineering innovation: concrete. Greek buildings could not generally have multiple stories because stone was too heavy a material to support. They could not have dome roofs for the same reason. The Romans were not the first to use concrete, but they were the first to use it as a building material. Other cultures may have used concrete to anchor columns or patch holes, but the Romans refined the recipe and discovered that it was lighter and stronger than stone, took up less space, and could have windows cut from it without compromising the wall. It was also much cheaper than stone and was poured into the desired shape, rather than built up. The affordability of concrete is one reason the Romans were able to build so many things across their empire.